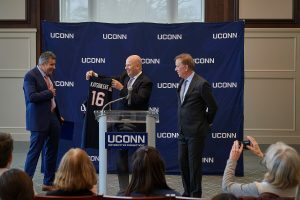 Thomas C. Katsouleas, who is currently executive vice president and provost of the University of Virginia, comes to Connecticut with the endorsement of Gov. Ned Lamont, who welcomed Katsouleas on Tuesday before an enthusiastic crowd in the Wilbur Cross Building. Here, Katsouleas talks with Tysen Kendig, vice president for communications.